On Saturday 11th May 1985, on the last day of the season, some Brighton & Hove Albion fans fought the police in skirmishes at the Goldstone Ground at the match with Sheffield United. Some 265 miles away, in Yorkshire, supporters and police were working frantically together to save lives. The Bradford City stadium fire remains the worst ever fire disaster in the history of British football, killing 56 supporters and injuring at least 265 at Valley Parade. While next year will mark the 30th anniversary, time has not dimmed the sense of horror and tragedy as the fire engulfed the whole of the main stand in under five minutes. At Valley Parade, the afternoon had actually begun in celebratory mood, with Bradford-born captain Peter Jackson being presented with the Division Three championship trophy before the match with Lincoln City. However, joy turned to despair and desperation at around 3.44pm after a match or cigarette had fallen through a hole in the wooden stand and caused an inferno. This afternoon we extend a very warm and sincere welcome to the players, officials, directors and supporters of Bradford City. Our visitors are promoted last season in style, but as the whole football world knows, their season ended in tragedy. However, the game must go on, and Trevor Cherry and his team started the new campaign in style at Carlisle last Saturday. Their redoubtable managerial duo is completed by another former Leeds player, and Terry Yorath was at Barnsley on Tuesday evening to watch our lads in action. Although Adrian Thorpe gave the visitors the lead at the Goldstone, Albion secured their first victory of the season with a Danny Wilson penalty before the interval, before Terry Connor’s second half header sealed the three points. The teams were also drawn against each other in the second round of the Milk Cup. In the home leg, a Danny Wilson hat-trick along with efforts from Martin Keown and Steve Penney propelled the Seagulls into a commanding 5-2 lead on 25th September before Alan Biley and Mick Ferguson completed the job in a 2-0 win in the away leg on 8th October. That October match was an historic occasion, as it was the first ever senior association football game to be played at Odsal Stadium, home of Bradford Northern Rugby League FC. The match took place there as Valley Parade was out of action for 19 months and being redeveloped. 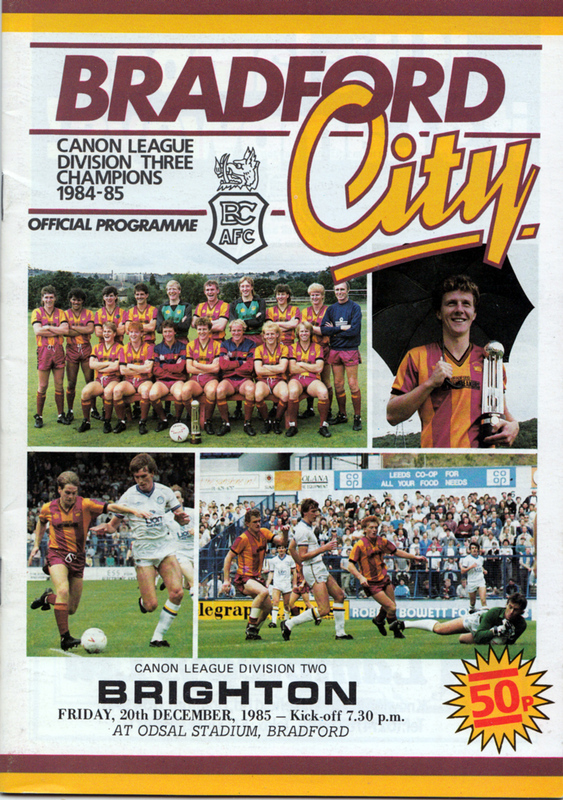 In 1985/86, the Bantams also played home fixtures at Elland Road, Leeds, and Leeds Road, Huddersfield. Despite playing on unfamiliar grounds, a spirited Bradford side won five of their first six ‘home’ matches in Division Two that campaign. In the wind and the rain at the Odsal on Friday 20th December, the Bantams got another win by beating the Seagulls for their first time that season. 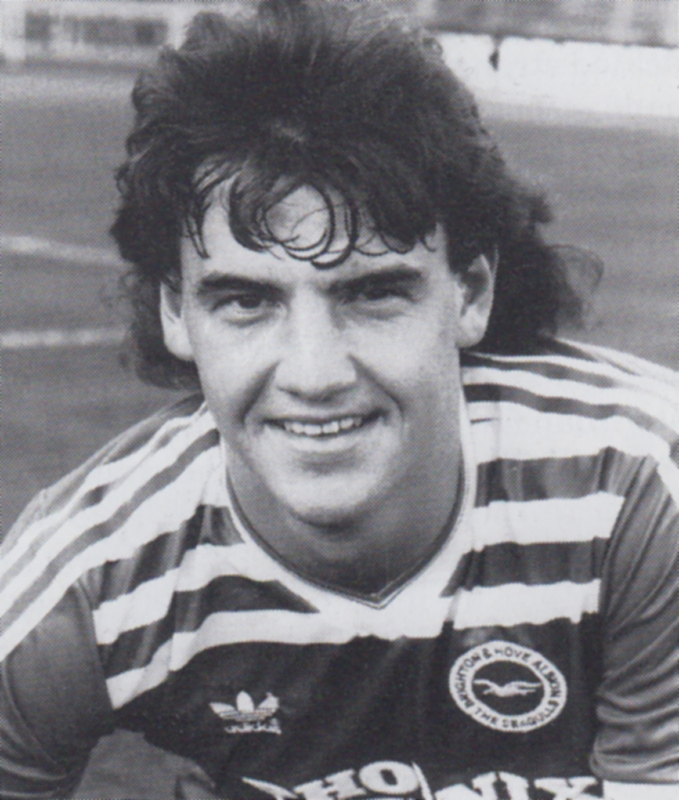 An unlikely Greg Abbott hat-trick, including two penalties by the defender, secured the 3-2 win despite second-half goals from Danny Wilson and Dean Saunders. 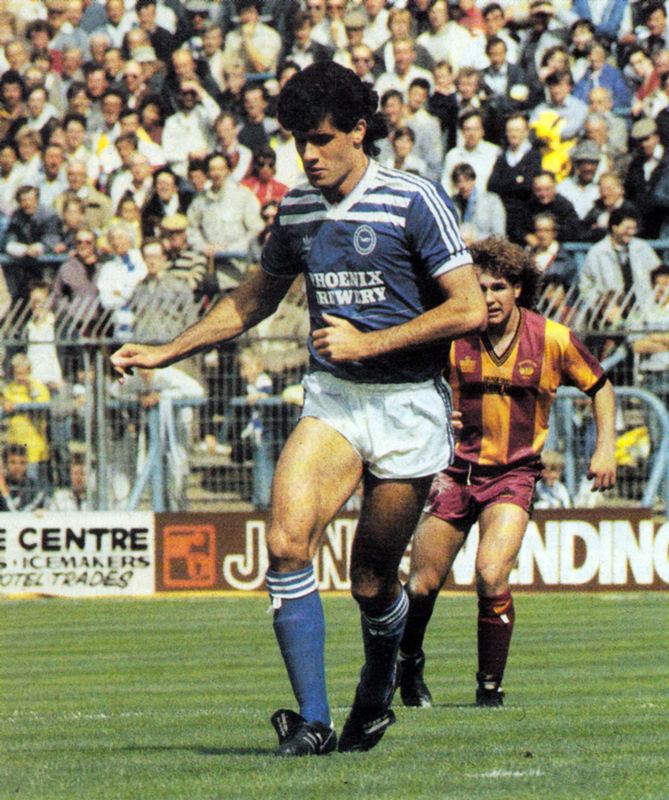 However, Chris Cattlin could not afford to make the deal permanent and in November, Oliver signed for Bradford from the Owls in a £25,000 deal. In the fixture at the Odsal in December, Oliver’s floated ball for the Bantams led to the penalty from which Abbott got the winner. 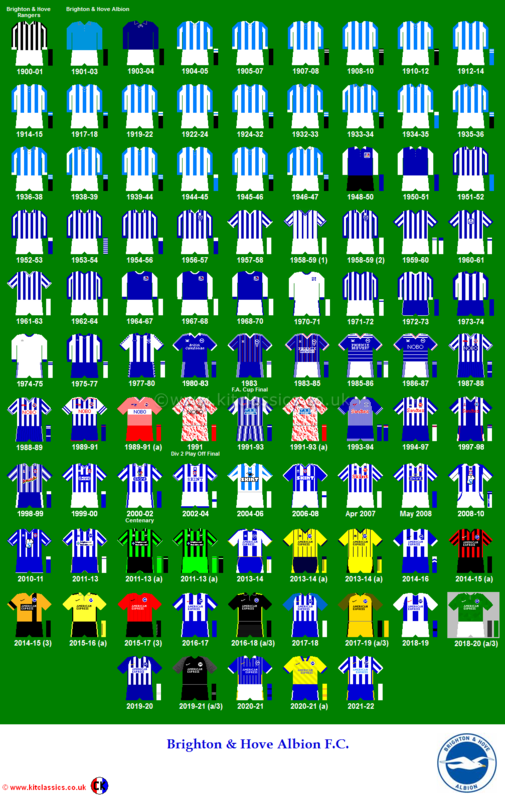 At the end of the 1985/86, Brighton finished 11th with 56 points while Bradford were two positions (and just two points) behind. One of the saddest days in football – like Hillsborough, I wept that day…..